Note: The following was originally printed in the November/December 2018 edition of Mormonism Researched. To request a free subscription, please visit here. At a recent church meeting where I spoke about The Miracle of Forgiveness evangelistic approach described in a chapter found in Sharing the Good News with Mormons (Kregel, 2018), two young male LDS missionaries approached my table and we began to talk. I explained how I enjoy giving away 12th President Spencer Kimball’s book to Latter-day Saints walking to events sponsored by The Church of Jesus Christ of Latter-day Saints, including General Conference sessions, temple open house events, and BYU football games. As we talked, I referenced 2 Nephi 25:23. One of the missionaries (elders) looked at me and exclaimed, “Isn’t that a great verse? !” I asked if he could recite it for me and he had trouble. Then I gave him a hint. “We are saved by grace…” I started. He looked at me and smiled. “We’re saved by grace in spite of all we can do,” he responded. I told him that the verse actually says “it is by grace that we are saved, after all we can do.” “Well,” he quickly responded, “in the passage’s context, the word after really means in spite of.” He added that his mission president agreed with this interpretation. Taken at face value, the idea that believers are saved by grace “in spite of all we can do” seems to be biblical. After all, the Bible teaches that there is nothing a person can do to earn God’s favor, no matter how much effort is exerted. The question we must ask is what did Joseph Smith, the “translator” of the Book of Mormon, mean when he wrote the word “after” in this verse? I understand the preposition “after” in 2 Nephi 25:23 to be a preposition of separation rather than a preposition of time. It denotes logical separateness rather than temporal sequence. We are saved by grace “apart from all we can do,” or “all we can do notwithstanding,” or even “regardless of all we can do.” Another acceptable paraphrase of the sense of the verse might read, “We are still saved by grace, after all is said and done” (pp. 91-92). LDS commentators are agreed that the word after in this passage is used as a preposition of separation rather than of time. The sense is that apart from all we can do, it is ultimately by the grace of Christ that we are saved. This meaning is apparent from the fact that none of us actually does all he can do (p. 125). Robinson is correct that “none of us actually does all he can do.” This seems to be the crux of the matter and the reason why he wishes to change the meaning of the word “after.” When commentators have a doubt about the way a biblical verse ought to be understood, the original Greek and Hebrew can be studied to determine a passage’s meaning. Unfortunately, the gold plates supposedly containing the Book of Mormon’s writings were said to be taken back by the angel Moroni, so it’s impossible to know the structure of the original “reformed Egyptian.” Thus, we are forced to make a judgment based on the English word “after” because this is all we have. After we have done all that we can do, after we have denied ourselves of ungodliness and worldly lusts, then is the grace of God sufficient for us; then we are sanctified in Christ and eventually made perfect in Christ (see 2 Nephi 25:23; Moroni 10:32) (Joseph Fielding McConkie and Robert L. Millet, Doctrinal Commentary on the Book of Mormon 2:258). Regardless of the opinion given by Robinson, there are two important reasons why “after all we can do” should be understood as a preposition of time. Behind in place; as, men placed in a line one after another. Later in time; as, after supper. This word often precedes a sentence, as a governing preposition. After I have arisen, I will go before you into Galilee. Math. 26. In pursuit of, that is, moving behind, following; in search of. After whom is the king of Israel come out? 1 Samuel 24:8. Ye shall not go after other Gods. Deuteronomy 6:14. In imitation of; as, to make a thing after a model. According to; as, consider a thing after its intrinsic value. According to the direction and influence of. To walk after the flesh; to live after the flesh. Romans 8:1. To judge after the sight of the eye. Isaiah 11:3. To inquire after is to seek by asking; to ask concerning. To follow after in scripture, is to pursue, or imitate; to serve, or worship. “We are saved by grace behind in place after all we can do”—this doesn’t fit. This meaning fits the definition of time and is a natural meaning of this verse. “We are saved by grace in pursuit of all we can do”—this doesn’t fit. “We are saved by grace in imitation of all we can do”—this doesn’t fit. “We are saved by grace according to all we can do”—even if this fit, it still would contradict Robinson’s interpretation. No example can be found in the 1828 dictionary to support the idea that “after” could mean “apart from all we can do,” “all we can do notwithstanding,” “regardless of all we can do,” or “in spite of all we can do.” Thus, it is highly unlikely that any reader in Smith’s day could have understood this verse to mean anything other than a person is saved by grace after (“later in time”) all they can do. In spite of attracting an income tax raid last year, the minister kept his scams going. Despite being so rich, they are not very kind to people. Those are the best examples I could find that MIGHT fit the word “after”…but they don’t. MAYBE, maybe, maybe “even after” works, but “after” by itself does not. If the verse said “…we are saved by grace EVEN AFTER all we can do,” we’d have something to talk about. But it doesn’t say that. As much as I think he wishes it did. One passage in the Book of Mormon, written perhaps with the same intent as Paul’s statement above—to stress and induce appreciate for the gracious gift of salvation offered on condition of obedience—is particularly enlightening (The Miracle of Forgiveness, p. 207. Emphasis mine). What is meant by “after all we can do”? “After all we can do” includes extending our best effort. “After all we can do” includes living His commandments. “After all we can do” includes loving our fellowmen and praying for those who regard us as their adversary. “After all we can do” means clothing the naked, feeding the hungry, visiting the sick and giving “succor [to] those who stand in need of [our] succor” (Mosiah 4:15)—remembering that what we do unto one of the least of God’s children, we do unto Him (see Matthew 25:34-40; D&C 42:38). “After all we can do” means leading chaste, clean, pure lives, being scrupulously honest in all our dealings and treating others the way we would want to be treated (The Teachings of Ezra Taft Benson, p. 354. Brackets in original). Many people think they need only confess that Jesus is the Christ and then they are saved by grace alone. We cannot be saved by grace alone, “for we know that it is by grace that we are saved after all we can do” (Ensign (Conference Edition), November 2001, p. 18). The true value of the sacrifice of Christ means much more than this general salvation which comes to all mankind. There is an additional salvation that God has planned for his children. This additional salvation is an individual salvation and is conditioned not only upon grace, but also upon obedience to gospel law (“Salvation and Exaltation,” Ensign, July 1972, p. 78). Apostle Boyd K. Packer agreed with “after” as referencing a preposition of time, saying, “Even that grace of God promised in the scriptures comes only ‘after all we can do’” (“The Brilliant Morning of Forgiveness,” Ensign, November 1995 (Conference Edition), p. 19). And a church manual states, “The phrase ‘after all we can do’ teaches that effort is required on our part to receive the fulness of the Lord’s grace and be made worthy to dwell with him” (True to the Faith: A Gospel Reference, 2004, p. 77). In other words, we contribute to our salvation, but we do not earn it. That was also the spirit of Paul’s message: “For by grace are ye saved through faith; and that not of yourselves: it is the gift of God: not of works, lest any man should boast” (Ephesians 2:8-9). Thus works alone cannot save us; grace is an absolute prerequisite. But a certain amount of works (i.e., the best we have to offer) are necessary to trigger God’s grace and mercy. No matter how hard we work, how diligently we serve, or how righteously we live, we will never deserve more than we receive (p. 311). Confusing words. He cites from Ephesians that salvation is a “gift of God: not of works,” yet he still says “we will never deserve more than we receive.” Works “alone” can’t save us, he says, as “grace is an absolute prerequisite.” So, in other words, it is not by grace alone but grace and works (“saved by grace after all we can do”). Such a stand, while sounding “almost biblical,” is still in opposition to both Ephesians 2:8-9 that was conveniently cited as well as interpretation of 2 Nephi 25:23 given by the missionary. Callister’s explanation correlates with the traditional interpretation of 2 Nephi 25:23, which is works are definitely needed and salvation does not come by grace alone. One leader who did not mince his words was the eleventh president of the church, Harold B. Lee. Before citing 2 Nephi 25:23, Lee explained, “But all of these blessings are ours on one condition, and this is spoken of by Nephi” (Conference Reports, April 1956, p. 111). In a later general conference talk, Lee also said, “Truly we are redeemed by the atoning blood of the Savior of the world, but only after each has done all he can to work out his own salvation” (Conference Reports, October 1970, p. 116). “‘For we labor diligently to write, to persuade our children, and also our brethren, to believe in Christ, and to be reconciled to God; for we know that it is by grace that we are saved, after all we can do.’ (2 Nephi 25:23.) The Savior’s blood, His atonement, will save us, but only after we have done all we can to save ourselves by keeping His commandments. All of the principles of the gospel are principles of promise by which the plans of the Almighty are unfolded to us” “All we have to do in order to be prepared to enter the presence of the Lord is to forsake our sins, come unto Him, call on His name, obey His voice, and keep His commandments; then we shall be able to see His face and to know that He is” (Harold B. Lee, Stand Ye in Holy Places: Selected Sermons and Writings of President Harold B. Lee, p. 246) See also Teachings of Presidents of the Church: Harold B. Lee, p. 24). “When you think about it, there is so much promised in the gospel for so little required on our part. For example, the ordinance of baptism is given us for the remission of sins, for entrance into the kingdom–a new birth; the gift of the Holy Ghost gives us the right to companionship with one of the Godhead; administration to the sick qualified the individual with faith for a special blessing; by paying our tithing, the windows of heaven may be opened unto us; by fasting and by praying our fast offerings, we are told that then we might call on the Lord and He will hear our cry and our call; celestial marriage promises us that family life will exist beyond the grave. But all of these blessings are ours on one condition, and this is spoken of by Nephi, when he said: ‘For we labor diligently to write, to persuade our children, and also our brethren, to believe in Christ, and to be reconciled to God; for we know that it is by grace that we are saved, after all we can do.’ (2 Nephi 25:23.) (Harold B. Lee, Stand Ye in Holy Places: Selected Sermons and Writings of President Harold B. Lee, pp. 366-367). “The simple essence of all you need to know about the Atonement is to be found in the teachings of the great prophet Nephi when he said, ‘We labor diligently to write, to persuade our children, and also our brethren, to believe in Christ, and to be reconciled to God; for we know that it is by grace that we are saved, after all we can do’ (2 Nephi 25:23). Don’t you let anyone try to persuade you to any other doctrine than that. Except for the atoning power, the redeeming power, of the Master, redeeming the world from the Fall, bringing us back into relationship with one of the Godhead, the Holy Ghost—were it not for His sacrifice for us, none of us would be worthy to enter in His presence, except we were bathed in His blood through repentance of all our sins and our faithfulness to the end (see 3 Nephi 27:19). That [is] the pure doctrine of the scriptures” (Harold B. Lee, “Viewpoint of a Giant,” Summer School Devotional Address, Department of Seminaries and Institutes of Religion, Brigham Young University, July 18, 1968. Cited in The Teachings of Harold B. Lee, pp. 7-8). “ULTIMATE SALVATION COMES TO THOSE WHO OBEY. The ancient prophets of this western continent have clearly set forth in understandable language the obligation of each individual to obtain the highest of these eternal privileges in mortality and in the world to come, for here we find written: ‘For we labor diligently to write, to persuade our children, and also our brethren, to believe in Christ . . . for we know that it is by grace that we are saved, after all we can do’ (2 Nephi 25:23). In other words, each must do all he can to save himself form sin; then he may lay claim to the blessings of redemption by the Holy One of Israel, that all mankind may be saved by obedience to the law and ordinances of the gospel. Jesus also atoned not only for Adam’s transgressions but for the sins of all mankind. But redemption from individual sins depends upon individual effort, with each being judged according to his or her works. The scriptures make it clear that while a resurrection will come to all, only those who obey the Christ will receive the expanded blessing of eternal salvation” (Harold B. Lee, “To Ease the Aching Heart,” Ensign, April 1973, p. 5. Cited in The Teachings of Harold B. Lee, pp. 17-18. Ellipsis in original). “THE LORD BLESSES US TO THE DEGREE WE KEEP THE COMMANDMENTS. The Lord will bless us to the degree to which we keep His commandments. Nephi put this principle in a tremendous orbit when he said, ‘For we labor diligently to write, to persuade our children, and also our brethren, to believe in Christ, and to be reconciled to God; for we know that it is by grace that we are saved, after all we can do’ (2 Nephi 25:23). The Savior’s blood, His atonement, will save us, but only after we have done all we can to save ourselves by keeping His commandments” (Harold B. Lee, Address at MIA Conference, 17 June 1966. Cited in The Teachings of Harold B. Lee, p. 186). “Certainly, ‘we believe that through the Atonement of Christ, all mankind may be saved, by obedience to the laws and ordinances of the gospel’ (Articles of Faith 1:3)” (David A. Bednar, “Therefore They Hushed Their Fears,” Ensign (Conference Edition), May 2015, p. 49). “Salvation and eternal life would not be possible if it were not for the Atonement, brought about by our Savior, to whom we owe everything. But in order for these supreme blessings to be effective in our lives, we should first do our part, ‘for we know that it is by grace that we are saved, after all we can do.’ Let us with faith, enthusiasm, dedication, responsibility, and love do all that is within our reach, and we will be doing all that is possible to achieve the impossible—that is, to achieve what for the human mind is impossible but with the divine intervention of our loving Father and the infinite sacrifice brought about by our Savior becomes the greatest gift, the most glorious of realities, to live forever with God and with our families” (“Attempting the Impossible,” Ensign (Conference Edition), November 2009, p. 34). “Elder B.H. Roberts of the Seventy (1857-1933) explained how the unconditional nature of the Atonement in regard to Adam’s transgression and its conditional nature regarding men’s personal sins is a doctrine ‘peculiar to ‘Mormonism’…and is derived almost wholly from the teachings of the Book of Mormon. In that distinction the beauty and glory of the Atonement, the balanced claims of justice and mercy shine forth as no where else, even in holy writ, — much less in the uninspired writings of men. It may be regarded as the ‘Mormon’ contribution to views of the Atonement of Christ, for it is to be found no where else except in Mormon literature.’ The perfect relationship between the atoning grace of Christ and the obedient efforts of mankind is powerfully stated by Nephi: ‘We know that it is by grace that we are saved, after all we can do’ (2 Nephi 25:23). Furthermore, we are invited to ‘come unto Christ, and be perfected in him.’ When we deny ourselves ‘of all ungodliness,’ then and only ‘then is his grace sufficient’ for us (Moroni 10:32)” (“Plain and Precious Truths Restored,” Ensign, October 2006, p. 53. Ellipsis in original). 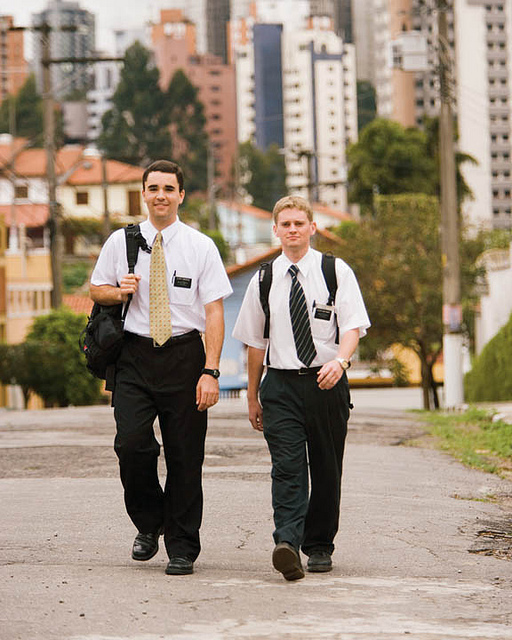 Many Mormons (like the missionary described at the beginning of this article) may want to soften the stringent requirements demanded by the teachings of their scriptures and leaders. However, 2 Nephi 25:23 offers no support for the belief that a person is saved by grace “in spite of” one’s maximum effort. This interpretation does not fit the English grammar of the 19th or even 21st centuries, but it also does not concur with the interpretations given by many different LDS authorities. Second Nephi 25:23 continues to emphasize the necessity of obedience to the commandments of God for a person to obtain exaltation and godhood. Misinterpreting this verse and changing its natural (and traditional) meaning only leads to confusion for those who aim is to understand what the Book of Mormon is saying.